Sometimes our design can be limited by the layout or budget allotted to us. Just because you may have a small room does not restrict you from expressing your design style in it. There are so many creative ways you may not have considered to save space in your home, studio, or apartment. We put together a small, unique list of great space saving tricks to use in your home. Let’s take a look! 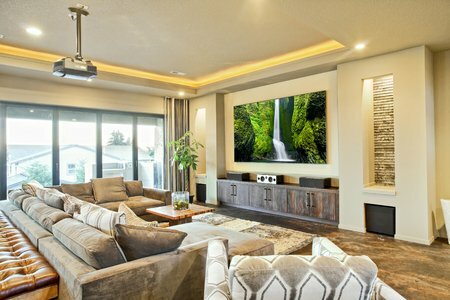 Televisions have been getting thinner and thinner, but with entertainment stands and extra wiring, they can quickly become an eyesore in a small room. Investing in a projector can be a simple way to free up a ton of space in a small living room or a tiny family room. You can put it on a multiple-purpose rolling end table and easily move it in and out of the way. Purchasing a pull-down screen or even using a pure white wall will allow you to maximize your space in ways to did not consider before. Having a large size bed can use up your room’s precious square footage quickly. Switching your bed into a Murphy bed is a great way to get your space back. When you are not using your bed, simply fold your bed up vertically again the wall, inside a closet, or into a cabinet. Murphy beds have a unique hinge system which allows you to store your bed against the wall when you are not using it or pull it down when it is time for bed. Shelving is a valuable amenity to have in your kitchen but what do you do if you do not have enough storage space. If you have some space between your refrigerator and your cabinets, consider having a narrow sliding pantry. Install wheels on the bottom so it can easily slide in and out of storage. You can facilitate this space to store your spices, canned goods, and sauces. Also, you may have room underneath your cabinets where the kickboard is installed to put more sliding storage. These are just some unique ideas you may not have considered adapting into your homes. There are many simple tricks to add to like multipurpose furniture with storage, more shelving, and reducing furniture. Try to be creative with the space you have and you will discover many different ways to save on room.